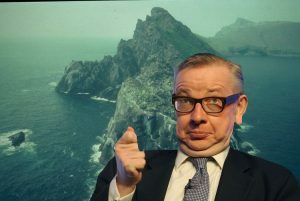 Theresa May has offered an olive branch to Michael Gove by appointing him to a new government department based in St. Kilda. “This is not a demotion, however giving his track record of betrayal I wouldn’t trust him to be any closer than 554 miles to cabinet” said May. “There isn’t even a Waitrose there!” she cackled with delight. The new department will have a total staffing of 1 and will bring the island’s total permanent population up to 1. It will be located on a skerry off the coast of Boreray and it’s main duties will be “processing seabird oil for sustenance” and “thinking very hard about what you’ve done Gove”.